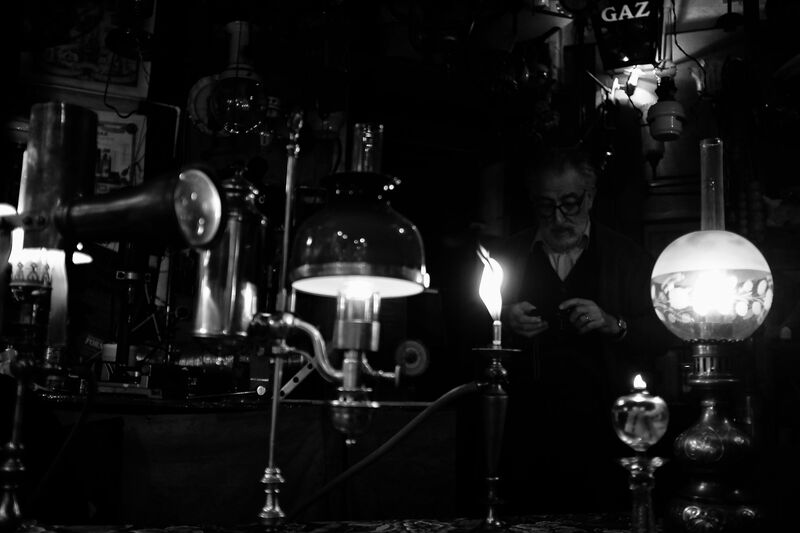 Monsieur Ara in his lamp workshop. Photo: Aysegul Savas. Of the ten thousand books in the library of Ottoman Sultan Abdülhamid II, two thousand were detective novels. Abdülhamid also founded the first secret service and sent spies across the empire to report to him. Many sources cite these two facts—the Sultan’s love of mystery novels and his secret service—back to back. I agree that the story, told like this, stirs the imagination. Inside a blue shop at the end of rue Flatters in Paris, lamps hang from every inch of the ceiling. There are globes and barrels, in brass and opaline, in marbling swirls of orange and red, dark green, blue, and pink. Lamps line the shelves, spilling over to the crimson carpet on the wooden floor; mantles, finials, and valves are stacked in every nook. The shop, however, is dimly lit, a faint smell of gas coming from the back room where the proprietor, Monsieur Ara, with large square spectacles, trimmed beard, bow tie, and vest, sorts through his collection of thousands of pieces. Bent over the large worktable on his high stool, he fixes lamps, strings glass beads for fringes, and demonstrates the history of lighting to his visitors—from round wick to flat yellow flame to blue—illuminating the scientific discoveries of the Industrial Revolution one by one. Finally, there is the switch from oil to gas lamps. This is the birth of the mystery novel as well, the gaslight novel. In the sultan’s thirty-three-year reign, which began in 1876 with the suspension of the Ottoman Parliament and the restoration of absolute monarchy, more than fifty mystery novels were translated into Turkish. The first Turkish mystery, also written during the reign of Abdülhamid, is Ahmet Mithat’s Esrar-ı Cinayet (Mysteries of the murder). It’s an amateur example of the genre: the culprit, Mustafa the Counterfeiter, drops from the sky at the end, in a denouement unrelated to the book’s other developments. The best mysteries—and those preferred by the sultan, judging from his library—must be solved with the discerning light cast by their investigator and not with the inventions of the author. The pleasure of reading a mystery novel, for me as it must have been for the sultan, is in the moment of illumination. Coming of age in the Industrial Revolution, illumination in the mystery novel is as literal as it is metaphorical. The cityscapes of gas and electric lighting created new backdrops for the imagination: deserted, half-lit streets at nighttime, solitary figures appearing and disappearing from lamplight into fog. In Stevenson’s novel, the transformations of day into night are as potent as the doctor’s potion. But what caught the sultan’s attention in this issue of Strand was a story, “The Empty House,” by a certain Arthur Conan Doyle. The sultan was so impressed by the story’s snug-fitting logic that he asked the consulate in London to send him all the works of its author. The Sherlock Holmes stories were translated privately for the sultan and recorded in the Yıldız Palace catalogs. They were translated for the general public some years later, at the start of the second constitutional era, just as Abdülhamid was about to be dethroned. In 1907, Arthur Conan Doyle visited Istanbul during his honeymoon journey, where Abdülhamid awarded him the Order of the Mejidie. Monsieur Ara is an Armenian from Istanbul. He is also a chemist, a polyglot, and a world expert on gas lighting. I visit him in the late afternoons, walking the four streets from my writing desk to his workshop with a lemon loaf cake or a box of financiers from our neighborhood bakery. We have Turkish coffee that Monsieur Ara makes on a Bunsen burner, or tea from his pale-orange porcelain set left to him by his mother. Another pleasure of the visit is hearing Monsieur Ara speak Turkish with the refined vocabulary and pronunciation of an old Istanbul gentleman. The musicality of his speech is like a fugue, measured and elegant. Even on surprise visits, when I enter rattling the doorbell, he looks up from his work calmly as if he had seen me coming. He’s always following a lead, investigating the etymology of a word. After I leave, he’ll tie the loose ends of our conversations in an email, telling me, for example, that the rubber tree of the Mediterranean coast is not at all the Brazilian rubber, Hevea brasiliensis, but rather a type of fig, Ficus elastica. He loves puns and wordplay. One afternoon, when we’re discussing coincidences, he tells me that his own name basically means light, deriving from the Armenian root ar, for the sun. Inevitably, our conversations return to Istanbul. We exchange briefly on worrisome developments before Monsieur Ara guides me on an imaginary walk through the curiosities of our city, paying particular attention to the feats of the industrial era—the train stations, bridges, and Art Nouveau buildings I’ve walked by countless times but whose distinct features I learn only with his guidance. Our conversations are never nostalgic. In Monsieur Ara’s shop, the past is not yearned for but preserved, with diligence and patience. Monsieur Ara does not disdain new technology, as I almost wish him to do so that he would be more like a character in a novel. Instead, he catalogs his restorations online, updates his Facebook account frequently with portraits of his new lamps on lace cloths, and regularly posts photographs of his walks around Paris and his travels in Europe and Istanbul. As I write this, he has a hundred sixty albums on his page, containing thousands of photographs. Many of them are of the old industrial neighborhoods of Istanbul’s Golden Horn, where workshops are slowly closing. “Naphtaline, colophane, cyanide, and other friendly poisons,” reads one caption for a shop selling chemical products, similar to his own father’s store when Monsieur Ara was a young boy. His photographs are always accompanied with the specific location. 11 avenue de Versailles. 62 rue Boursault. Place du Dr. Félix Lobligeois. Square des Batignolles. Sometimes I sense that, for him, the mere listing of place names is pleasure enough. In 1905, an Armenian revolutionary group attempted to assassinate Abdülhamid with a bomb placed in the sultan’s carriage outside the Yıldız Mosque. But the bomb went off too soon, as the sultan was walking back from the Friday prayers. The Times called the plot one of the most sensational political conspiracies of modern times, even if the event is now mostly forgotten. My favorite lamps are the ones that come with stories, like the long one shaped like a telescope invented by the Prussian king’s doctor and used by otolaryngologists at the turn of the century. Or the clock lamp given to Monsieur Ara by a Parisian on her deathbed, who feared that her family would not understand its value. One of the lesser known works of Robert Louis Stevenson is a technical manual, which is Stevenson’s small contribution to his family trade: On a New Form of Intermittent Light for Lighthouses. It’s hard to reconcile the despotic rule of Abdülhamid with the picture of the bookish sultan, who was also an expert watchmaker and carpenter. He is remembered as the “red sultan” for the Hamidian massacres of hundreds of thousands of Armenians and Assyrians. He is also remembered for the exquisite libraries, tables, and chests he produced in his carpentry workshop, some of which are housed in the Istanbul University library, along with his collection of mystery novels. In his house, Robert Louis Stevenson had a chest of drawers from the Edinburgh workshop of the cabinetmaker William Brody, who was the model for Stevenson’s play The Double. A respectable deacon by day, Brody would leave his house at nights to go robbing. Stevenson must have been aware of the scientific theories about the emergence of secondary selves, popular in European journals of the nineteenth century. In one article, titled “Have We Two Brains,” the astronomer and journalist Proctor describes the case of Sergeant F., whose moral nature is disturbed to reveal an animalistic second self. The sultan is dethroned in 1909, the constitution is reinstated, and Abdülhamid is exiled to Thessaloniki. The day after he arrives for his house arrest, he asks when he will receive his watchmaking and carpentry tools. In 1911, the Armenian writer Yervant Odian published the detective novel Abdülhamid and Sherlock Holmes. In the novel, three of the sultan’s secret agents are found murdered in an empty mansion on the Bosphorus. When the Ottoman police force is unable to solve the case, the sultan calls the famous English detective to assist in Constantinople. Monsieur Ara is not familiar with Odian, neither as a detective writer nor for his better-known book, The Accursed Years, about his deportation to the Syrian dessert. “But I used to know a man like him, who came back alive,” he says. He was very old when Monsieur Ara was a child; he played cards and talked little. “And did he talk about his past?” I ask. I say it must have been strange for this man to return to Istanbul and live among the people who are capable of this complicity. It is a question I’ve never asked him—what resentment he feels, what anger, what loss. I’ve never asked him about his sense of belonging either. I feel, whenever we skirt these topics, that my identity might be offensive to him in some way, that I’m blind to my past, to the reckless survival and triumph of people like me. To make up for it, I tell Monsieur Ara that my family has Armenian ancestors, and he tells me that is no wonder, as if this explained our friendship. I don’t tell him, however, that this Armenian ancestor is only hearsay, and that my grandmother, when we ask her for details, would rather sweep the whole matter aside. The resemblance is unmistakable. The nose, the cheekbones, the tapering face and beard. I ask whether he is certain of this fact, reminding him of Abdülhamid’s atrocities. It’s only fitting that Hyde remains in the shadows because he has emerged from the darkness of Dr. Jekyll’s mind—because he is the very embodiment of that darkness. The pleasure of the detective novel is not only in the moment of illumination but also in its eclipsed double. We wander the novel’s dim streets with the delight that no misfortune can befall us while danger lurks just out of our sight. It is the pleasure of approaching the menacing unknown, otherwise kept at bay, like the crouching darkness of our own minds. Aysegul Savas is a writer based in Paris. Her first novel, Walking on the Ceiling, is forthcoming from Riverhead Books. On a New Form of Intermittent Light in Lighthouses.